4,000 ft lighted hard-surface runway. Use by the general public is forbidden. Permission for guests to arrive should be obtained before landing. Courtesy parking is available for visitors. Tie-down space is usually available except during special events. Taxiways are dual use, be alert for vehicles and pedestrians. Avoid prolonged engine operations in residential areas. Operations between 10pm and 6 am discouraged. Services: Airframe and Powerplant repair. No, Prior permission/invitation to land by a property owner is required. Rotating Beacon located approximately 1400 FT SE (perpendicular) from mid-point of Runway 05/23 on 50ft Antenna pole. Controlling Object Trees: 50 ft high, 700 ft from runway end, on the centerline. - Clearance slope is 8:1. - Object is not marked or lighted. Trees: 50 ft high, 750 ft from runway end, on the centerline. - Clearance slope is 5:1. - Object is not marked or lighted. Runway Remarks - APPROACH RATIO 25:1 TO DISPLACED THRESHOLD. - APPROACH RATIO 23:1 TO DISPLACED THRESHOLD. - RUNWAY 06/24 TREES IN PRIM SURFACE NW SIDE 123' FROM CENTERLINE. - RUNWAY 06/24 TREES IN TRSN SURFACE BOTH SIDES OF RUNWAY. - GROUND COMMUNICATION OUTLET (GCO) AVAILABLE ON FREQUENCY 121.725 THRU DAB CLEARANCE DEL. - AUTO RUNWAY INFO FREQUENCY 122.750. - APPROACH RATIO 25:1 TO DISPLACED THRESHOLD. - APPROACH RATIO 23:1 TO DISPLACED THRESHOLD. - ROTATING BEACON LOCATED APRXLY 1400 FT SE (PERPENDICULAR) FROM MID-POINT OF RUNWAY 05/23 ON 50 FT ANT POLE. - MEDIUM INTENSITY RUNWAY LIGHTS (MIRL) RUNWAY 05/23 PRESET ON LOW INTENSITY DUSK-DAWN; TO INCR INTENSITY ACTIVATE - 122.975. - VFR ONLY; PRIVATE USE. AIRPORT HAS A PRIVATE GPS IFR APPROACH FOR USE OF RESIDENTS. ALL INFORMATION IS DEEMED ACCURATE BUT IS NOT TO BE RELIED ON FOR NAVIGATION OR FLIGHT PLANNING PURPOSES. ALL PILOTS ARE TO FOLLOW FAA PROCEDURES INCLUDED IN THE AIRMANS INFORMATION MANUAL, THE AIRPORT FACILITY DIRECTORY AND OTHER OFFICIAL SOURCES FOR UPDATES AS TO THE MOST CURRENT INFORMATION. SPRUCE CREEK AIRPORT IS A PRIVATE, INVITATION-ONLY AIRPORT AND HAS ADDITIONAL REGULATIONS. ALL PILOTS ARE EXPECTED TO FAMILIARIZE THEMSELVES WITH LOCAL PROCEDURES. TAXIWAYS ARE DUAL-USE, PILOTS MUST EXERCISE EXTREME CAUTION AND WATCH FOR VEHICULAR OR PEDESTRIAN TRAFFIC. All flying activities are regulated by the FAA and by the recommended procedures published in the Airman's Information Manual. In addition, the Spruce Creek Airport has a number of local rules and procedures established to promote a safe and enjoyable airport. All residents, tenants and invitees are encouraged to cooperate and abide by these procedures. 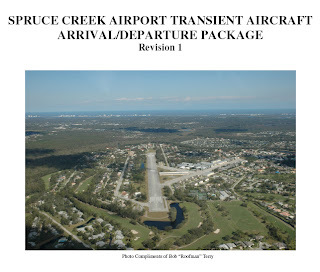 The airport management provides information to assist pilots who are unfamiliar with the Spruce Creek Airport. A copy of the Spruce Creek Airport Procedures can be downloaded and viewed/printed with Adobe Acrobat Reader. I finally found heaven on earth!. I made it to Spruce Creek as a stop to Sun-n-Fun from a 1,600nm trip from Venezuela (SVCS) in my P210, Thanks to the courtesies of Carlos Bravo who extended an invitation. The airport is fantastic and the runway is so wide you could land two airplanes side by side! Great Place!. The on-the-field Downwind Restaurant has great pizzas. Beautiful hangar mansions housing interesting planes. The people are very friendly and welcoming. I want to live there! I liked Spruce Creek so much I bought my airplane there. I visit often for lunch & dinner. Absolutely the best residential airpark in the world! My cousin just bought a home there, Carlos Bravo from Karlhaus Realty was his agent, a fine lad that has lived there in a hangar home for over 12 years and knows just about everybody there. I manufacture hangar doors and have just been to visit an owner and spruce creek, what a beautiful place! Is there rental cars available for residents that fly in for the weekend available within the community itself?